We are a non-commercial social carpooling community that helps regular commuters heading the same way, at the same time hitch a ride together. Car owners driving to their destinations can make their empty car seats available to those in need of a lift for a fee; while passengers enjoy a social and cost-effective ride. Whether you’re a driver with seats to spare, or a passenger who needs a hitch, GrabHitch helps the both of you to split costs and a ride. I’m a Passenger; How do I Hitch a Ride? 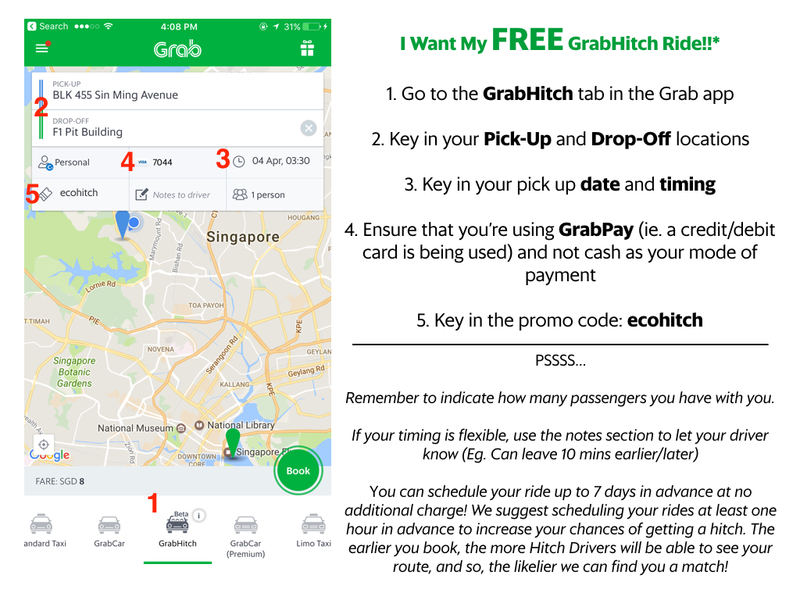 For those of you who’ve never tried GrabHitch before, use the promo code ECOHITCH to get your first GrabHitch ride for Free! I’m a Driver; How do I Sign Up to be a Hitch Driver? 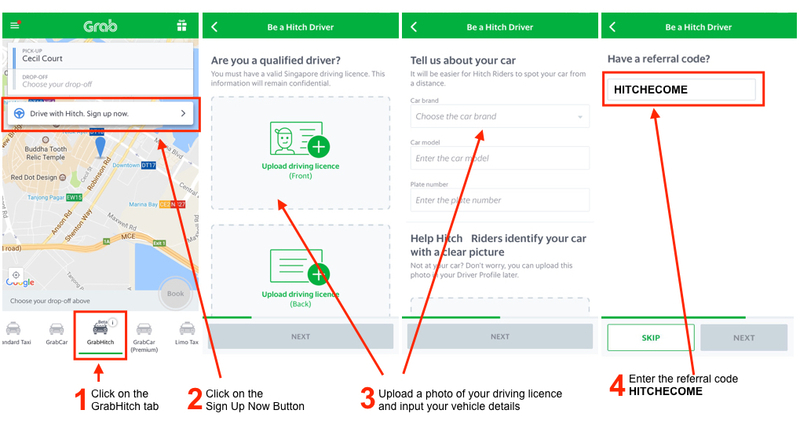 Anyone with a car and valid driving license can sign up to drive with GrabHitch – it takes less than 5 minutes, right from your mobile device! You are NOT driving for a commercial car hire service, you are essentially carpooling with someone who is going along the same way. This incentive is only eligible for new drivers who sign up and successfully complete ONE ride as a Hitch driver between 23 February 2017 @ 00:00 hours – 30th April 2017 @ 12:00 hours. New drivers must sign up with the referral code HITCHECOME in order to qualify for the $20 credit incentive. The processing of the $20 credit incentive will only be conducted after the incentive period has ended (Post-30th April 2017). Please allow up to 10 working days after the incentive period has ended (i.e. post-30th April 2017) for your credit to be processed. This promotion is only valid for Hitch Riders who have yet to complete a GrabHitch ride successfully. Bookings have to be made for GrabHitch rides between 03rd March 2017 00:00 hours to 30th April 2017 23:59 hours to be eligible for the promotion. Each passenger is entitled to use the promo code ONCE. This promotion with promo code “ECOHITCH” is only valid for the first 1,000 redemptions per calendar day. GrabHitch reserves the right to suspend any users suspected of fraudulent activities. If you’re still not sure how to sign up, or have any questions regarding GrabHitch, email us at grabhitch@grab.com with the Subject: HITCHECOME and we will get back to you in 1-3 working days.